Bison hunting (hunting of the American bison, also commonly known as the American buffalo) was an activity fundamental to the economy and society of the Plains Indians peoples who inhabited the vast grasslands on the Interior Plains of North America, prior to the animal's near-extinction in the late nineteenth century. The species' dramatic decline was the result of habitat loss due to the expansion of ranching and farming in western North America, industrial-scale hunting practised by non-indigenous hunters, increased indigenous hunting pressure due to non-indigenous demand for bison hides and meat, and even cases of deliberate policy by settler governments to destroy the food source of the native Indian peoples during times of conflict. Bison were first hunted for their meat, but now they are hunted for sport. The steppe bison (Bison priscus) was found in North America more than a million years ago, well before the first humans are believed to have arrived. It is believed to have evolved into the giant Ice Age bison (Bison latifrons) which lived from 200,000 years ago to 30,000 years ago. It was in turn replaced by Bison occidentalis, which is believed to have come from Eurasia, and Bison antiquus which evolved separately from B. priscus. The first human arrivals in North America, the Paleo-Indians, are believed to have hunted these last two species (occidentalis and antiquus), but did not rely on them to the exclusion of other large herbavorous mammals such as mammoths, mastodons, camels, horses, and ground sloths. Around 11,000-10,000 years ago, however, the majority of the large game species in North America became extinct, possibly due to climate change, overhunting, or some combination of these and other factors. One of the few large survivors was B. antiquus, but its average size declined until it evolved into the smaller modern American bison around 5,000 years ago. The modern American bison is split into two subspecies, the wood bison in the boreal forests of what is now Canada, and the plains bison on the prairies extending from Canada to Mexico. 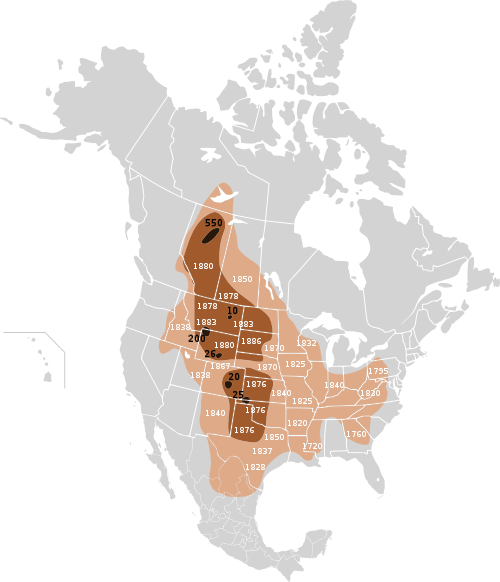 The plains subspecies became the dominant animal of the prairies of North America, where bison were a keystone species, whose grazing and trampling pressure was a force that shaped the ecology of the Great Plains as strongly as periodic prairie fires and which were central to the lifestyle of American Indians of the Great Plains. However, there is now some controversy over their interaction. "Hernando De Soto's expedition staggered through the Southeast for four years in the early 16th century and saw hordes of people but apparently did not see a single bison," Charles C. Mann wrote in 1491: New Revelations of the Americas Before Columbus. Mann discussed the evidence that Native Americans not only created (by selective use of fire) the large grasslands that provided the bison's ideal habitat but also kept the bison population regulated. In this theory, it was only when the original human population was devastated by wave after wave of epidemic (from diseases of Europeans) after the 16th century that the bison herds propagated wildly. In such a view, the seas of bison herds that stretched to the horizon were a symptom of an ecology out of balance, only rendered possible by decades of heavier-than-average rainfall. Other evidence of the arrival circa 1550–1600 in the savannas of the eastern seaboard includes the lack of places which southeast natives named after buffalo. Bison were the most numerous single species of large wild mammal on Earth. Working on foot, a few groups of Native Americans at times used fires to channel an entire herd of buffalo over a cliff, killing far more than they could use. The Olsen-Chubbuck archaeological site in Colorado reveals some techniques, which may or may not have been widely used. The method involves skinning down the back in order to get at the tender meat just beneath the surface, the area known as the "hatched area." After the removal of the hatched area, the front legs are cut off as well as the shoulder blades. Doing so exposes the hump meat (in the Wood Bison), as well as the meat of the ribs and the Bison's inner organs. After everything was exposed, the spine was then severed and the pelvis and hind legs removed. Finally, the neck and head were removed as one. This allowed for the tough meat to be dried and made into pemmican. Religion also played a big role in Native American bison hunting. Plains Indians generally believed that successful hunts required certain rituals. To Plains Indians, the buffalo was the most sacred animal, and they felt obligated to treat them with respect. When they were about to kill a buffalo, they would offer it a prayer. Failures in the hunt would often be attributed to poorly performed rituals. Each animal produced from 200 to 400 pounds of meat, so a slaughter of 50 animals produced far more food than could possibly be eaten by the band, a wastage that was often commented upon by European and American observers. Sometimes a herd would be killed just to get at the delicacies such as the fat-filled tongues. Bison that escaped the trap were hunted down and killed so they could not warn the other bison. Horses taken from the Spanish were well-established in the nomadic hunting cultures by the early 1700s, and indigenous groups once living east of the Great Plains moved west to hunt the larger bison population. In addition to using bison for themselves, these indigenous groups also traded meat and robes to village-based tribes. 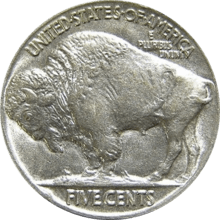 In the 16th century, North America contained 25-30 million buffalo. Bison were hunted almost to extinction in the 19th century. Less than 100 remained in the wild by the late 1880s. They were hunted for their skins, with the rest of the animal left behind to decay on the ground. After the animals rotted, their bones were collected and shipped back east in large quantities. Due to the roaming behavior of bison, their mass destruction came with relative ease to hunters. When one bison in a herd is killed, the other bison gather around the buffalo. Due to this pattern, the ability of a hunter to kill one bison often led to the destruction of a large herd of them. Thirty years ago millions of the great unwieldy animals existed on this continent. Innumerable droves roamed, comparatively undisturbed and unmolested, . . . Many thousands have been ruthlessly and shamefully slain every season for past twenty years or more by white hunters and tourists merely for their robes, and in sheer wanton sport, and their huge carcasses left to fester and rot, and their bleached skeletons to strew the deserts and lonely plains. The cause of this buffalo population crash is heavily debated by academics; some contend that indigenous peoples were responsible for just as much, if not more, of the bison extermination at this time. Because native people adapted to the social changes that resulted from Euro-American arrival in the West, some native people reinvented their style of hunting and thus drove the buffalo population down. Proponents of this view argue that some native people embraced the fur trade and adapted to bison hunting via horse, which drove up significantly the number of bison they could slaughter. Rath & Wright's buffalo hide yard in Dodge City, Kansas, showing 40,000 buffalo hides, . The US Army sanctioned and actively endorsed the wholesale slaughter of bison herds. The federal government promoted bison hunting for various reasons, to allow ranchers to range their cattle without competition from other bovines, and primarily to weaken the North American Indian population by removing their main food source and to pressure them onto the reservations during times of conflict. Without the bison, native people of the plains were often forced to leave the land or starve to death. One of the biggest advocates of this strategy was General William Tecumseh Sherman. On June 26, 1869, the Army Navy Journal reported: "General Sherman remarked, in conversation the other day, that the quickest way to compel the Indians to settle down to civilized life was to send ten regiments of soldiers to the plains, with orders to shoot buffaloes until they became too scarce to support the redskins." According to Professor David Smits: "Frustrated bluecoats, unable to deliver a punishing blow to the so-called "Hostiles,"unless they were immobilized in their winter camps, could, however, strike at a more accessible target, namely, the buffalo.That tactic also made curious sense, for in soldiers' minds the buffalo and the Plains Indian were virtually inseparable." This map of the extermination of bison to 1889 is based on William Temple Hornaday's late-nineteenth-century research. As the great herds began to wane, proposals to protect the bison were discussed. In some cases, individual military officers attempted to end the mass slaughter of these buffalo. William F. "Buffalo Bill" Cody, among others, spoke in favor of protecting the bison because he saw that the pressure on the species was too great. Yet these proposals were discouraged since it was recognized that the Plains Indians, often at war with the United States, depended on bison for their way of life. In 1874, President Ulysses S. Grant "pocket vetoed" a Federal bill to protect the dwindling bison herds, and in 1875 General Philip Sheridan pleaded to a joint session of Congress to slaughter the herds, to deprive the Indians of their source of food. By 1884, the American Bison was close to extinction. Most Indigenous Native American tribes regard the bison as a sacred animal and religious symbol. University of Montana anthropology professor S. Neyooxet Greymorning stated: "The creation stories of where buffalo came from put them in a very spiritual place among many tribes. The buffalo crossed many different areas and functions, and it was utilized in many ways. It was used in ceremonies, as well as to make tipi covers that provide homes for people, utensils, shields, weapons, and parts were used for sewing with the sinew." In fact, many tribes had "buffalo doctors", who claimed to have learned from bison in symbolic visions. Also, many Plains tribes used the bison skull for confessions and blessing burial sites. Though buffalo were being slaughtered in masses, many Indians perceived the buffalo as part of the natural world—something guaranteed to them by the Creator. In fact, for some Plains indigenous peoples, buffalo are known as the first people. Many Indians didn't grasp the concept of species extinction. Thus, when the buffalo began to disappear in great numbers, it was particularly harrowing to the Indians. As Crow Chief Plenty Coups described it: "When the buffalo went away the hearts of my people fell to the ground, and they could not lift them up again. After this nothing happened. There was little singing anywhere." Spiritual loss was rampant; buffalo were an integral part of Indian society and they would frequently take part in ceremonies for each buffalo they killed to honor its sacrifice. In order to boost morale during this time, Sioux Indians and other tribes took part in the Ghost Dance, which consisted of hundreds of people dancing until 100 persons were lying unconscious. Native Americans served as the caretakers of bison, so their forced movement towards bisonless reservation areas was particularly challenging. Upon their arrival to reservations, some tribes asked the Government officials if they could hunt cattle the way they hunted buffalo. During these cattle hunts, Plains Indians would dress up in their finery, sing bison songs, and attempt to simulate a bison hunt. These cattle hunts served as a way for the Plains Indians to preserve their ceremonies, community, and morale. However, the U.S. government soon put a halt to cattle hunts, choosing to package the beef up for the Native Americans instead. The mass buffalo slaughter also seriously harmed the ecological health of the Great Plains region, in which many Indigenous People lived. Unlike cattle, bison were naturally fit to thrive in the Great Plains environment; bisons' giant heads are naturally fit to drive through snow and make them far more likely to survive harsh winters. Additionally, bison grazing helps to cultivate the prairie, making it ripe for hosting a diverse range of plants. Cattle, on the other hand, eat through vegetation and limit the ecosystem's ability to support a diverse range of species. Agricultural and residential development of the prairie is estimated to have reduced the prairie to .1% of its former area. The plains region has lost nearly one-third of its prime topsoil since the onset of the buffalo slaughter. Cattle are also causing water to be pillaged at rates that are depleting many aquifers of their resources. Research also suggests that the absence of native grasses leads to topsoil erosion—a main contributor of the dust bowl and black blizzards of the 1930s. Wikimedia Commons has media related to Bison hunting. ↑ Rostlund, Erhard (1 December 1960). "# The Geographic Range of the Historic Bison in the Southeast". Annals of the Association of American Geographers. Taylor & Francis, Ltd. 50 (4): 395–407. doi:10.1111/j.1467-8306.1960.tb00357.x. ISSN 0004-5608. JSTOR 2561275. ↑ Juras, Philip (1997). "The Presettlement Piedmont Savanna: A Model For Landscape Design and Management". Retrieved July 21, 2008. ↑ Krech III, Shepard. "Buffalo Tales: The Near-Extermination of the American Bison". National Humanities Center. Brown University. Retrieved April 13, 2015. ↑ Lueck, Dean (June 2002). "The Extermination and Conservation of the American Bison". Journal of Legal Studies. University of Chicago Press. 31 (2): 609–652. JSTOR 10.1086/340410. 1 2 3 Taylor, Scott (March 2007). "Buffalo Hunt: International Trade and the Virtual Extinction of the North American Bison" (PDF). NBER. National Bureau of Economic Research. Retrieved April 6, 2015. 1 2 Records, Laban (March 1995). Cherokee Outlet Cowboy: Recollectioons of Laban S. Records. Norman, Oklahoma: University of Oklahoma Press. ISBN 978-0-8061-2694-4. ↑ Wheeler, Homer (1925). Forty Years in the Old West: the Personal Narrative of a Cattleman Indian Fighter, and Army Officer. The Bobbs-Merrill Company. p. 82. OCLC 1112113. Retrieved April 12, 2015. ↑ "In the Prime of the Buffalo". Overland monthly and Out West magazine. 14 (83): 515. November 1889. ↑ Isenberg, Andrew (2000). The Destruction of the Bison. An Environmental History 1750–1920 (PDF). Cambridge University Press. p. 193. ISBN 0521771722. ↑ "American Buffalo: Spirit of a Nation". NPT. PBS. November 10, 1998. Retrieved April 7, 2015. 1 2 Smits, David (Autumn 1994). "The Frontier Army and the Destruction of the Buffalo: 1865–1883" (PDF). The Western Historical Quarterly. Utah State University. 25 (3): 312–338. doi:10.2307/971110. JSTOR 971110. Retrieved 30 March 2015. 1 2 Wooster, Robert (1988). "The Military and United States Indian Policy 1865-1903". ICE Case Studies: The Buffalo Harvest. Yale University Press. Retrieved April 12, 2015. ↑ Hanson, Emma I. Memory and Vision: Arts, Cultures, and Lives of Plains Indian People. Cody, WY: Buffalo Bill Historical Center, 2007: 211. ↑ Moulton, M (1995). Wildlife issues in a changing world, 2nd edition. CRC Press. 1 2 3 Smits, David (September 1994). "The Frontier Army and the Destruction of the Buffalo: 1865-1883" (PDF). Western Historical Quarterly. Michigan State University. 25 (3): 312–338. doi:10.2307/971110. Retrieved 6 April 2015. 1 2 Hämäläinen, Pekka (2008). The Comanche Empire. Yale University Press. pp. 294–299, 313. ISBN 978-0-300-12654-9. ↑ King, Gilbert (July 17, 2012). "Where the Buffalo No Longer Roamed". Smithsonian Magazine. The Smithsonian. Retrieved April 7, 2015. 1 2 Bergman, Brian (2004-02-16). "Bison Back from Brink of Extinction". Maclean's. Retrieved March 14, 2008. For the sake of lasting peace, let them kill, skin and sell until the buffaloes are exterminated. ↑ Foran, Max (1982). Calgary, Canada's frontier metropolis : an illustrated history. Windsor Publications. p. 26. ISBN 0-89781-055-4. 1 2 King, Gilbert (July 17, 2012). "Where the Buffalo No Longer Roamed". Smithsonian Magazine. The Smithsonian. Retrieved April 7, 2015. ↑ "Black Kettle". New Perspectives on The West. PBS. 2001. Retrieved April 7, 2015. 1 2 3 Duval, Clay. "Bison Conservation: Saving an Ecologically and Culturally Keystone Species" (PDF). Duke University. Retrieved April 13, 2015. 1 2 Jawort, Adrian (May 9, 2011). "Genocide by Other Means: U.S. Army Slaughtered Buffalo in Plains Indian Wars". Indian Country Today. Indian Country Today. Retrieved April 7, 2015. 1 2 3 Smits, David (Autumn 1994). "The Frontier Army and the Destruction of the Buffalo: 1865-1883" (PDF). The Western Historical Quarterly. Utah State University. 25 (3): 312–338. doi:10.2307/971110. Retrieved 7 April 2015. ↑ Jawort, Adrian (May 9, 2011). "Genocide by Other Means: U.S. Army Slaughtered Buffalo in Plains Indian Wars". Indian Country Today. Indian Country Today. Retrieved April 7, 2015. ↑ Duval, Clay. "Bison Conservation: Saving an Ecologically and Culturally Keystone Species". Duke University. Retrieved April 13, 2015. ↑ Hubbard, Tasha (2014). 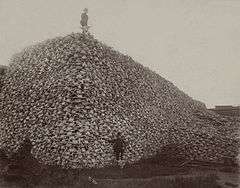 "Buffalo Genocide in Nineteenth Century North America: "Kill, Skin, Sell"". Colonial Genocide in Indigenous North America. Duke University Press. p. 294. doi:10.1215/9780822376149-014. ISBN 978-0-8223-5779-7. ↑ Harjo, Suzan. Nation to Nation: Treaties Between the United States and American Indian Nations. Smithsonian Books. p. 101. ISBN 1588344789. ↑ Parker, Z. A. (1890). "The Ghost Dance Among the Lakota". PBS Archives of the West. PBS. Retrieved 30 March 2015. ↑ Laduke, Winona (1999). All Our Relations: Native Struggles for Land and Life (PDF). Cambridge, MA: South End Press. p. 140. ISBN 0896085996. Retrieved 30 March 2015. ↑ Laduke, Winona (1999). All Our Relations: Native Struggles for Land and Life (PDF). Cambridge, MA: South End Press. p. 147. ISBN 0896085996. Retrieved 30 March 2015. ↑ Hearst Magazines (January 1931). Popular Mechanics. Hearst Magazines. pp. 1–. ISSN 0032-4558. Retrieved September 16, 2011. ↑ American Bison, U.S. Fish and Wildlife Service. Retrieved December 3, 2010. ↑ Staff (December 2011 – January 2012). "Restoring a Prairie Icon". National Wildlife. National Wildlife Federation. 50 (1): 20–25. ↑ National Bison Range – Dept of the Interior Recovery Activities. Recovery.doi.gov. Retrieved on September 16, 2011. ↑ American Bison Society > Home. Americanbisonsocietyonline.org. Retrieved on September 16, 2011. ↑ Where the Buffalo Roam. Mother Jones. Retrieved on September 16, 2011. ↑ "Ranches". Tedturner.com. Archived from the original on 2010-12-15. Retrieved November 11, 2013. ↑ Robbins, Jim (January 19, 2007). "Strands of undesirable DNA roam with buffalo". The New York Times. Archived from the original on April 16, 2009. Retrieved March 14, 2008. ↑ Polzhien, R.O. ; Strobeck, C.; Sheraton, J.; Beech, R. (1995). "Bovine mtDNA Discovered in North American Bison Populations". Conservation Biology. 9 (6): 1638–43. doi:10.1046/j.1523-1739.1995.09061638.x. JSTOR 2387208. ↑ Halbert, N.D.; Ward, T.J.; Schnabel, R.D. ; Taylor, J.F. ; Derr, J.N. (2005). "Conservation genomics: disequilibrium mapping of domestic cattle chromosomal segments in North American bison populations" (PDF). Molecular Ecology. 14 (8): 2343–2362. doi:10.1111/j.1365-294X.2005.02591.x. ISSN 0962-1083. PMID 15969719. Retrieved March 14, 2008. ↑ Halbert, Natalie Dierschke (2003). "The utilization of genetic markers to resolve modern management issues in historic bison populations: implications for species conservation" (PDF). Archived (PDF) from the original on September 26, 2007. Retrieved March 14, 2008. 1 2 3 Patel, Moneil (June 1997). "Restoration of Bison onto the American Prairie". UC Irving. UC Irving. Retrieved April 7, 2015. ↑ "American Bison and American Indian Nations". Smithsonian Institution National Zoo. Smithsonian. Retrieved April 7, 2015. ↑ Higgins J, Stuber T, Quance C, Edwards WH, Tiller RV, Linfield T, Rhyan J, Berte A, Harris B (2012). "Molecular epidemiology of Brucella abortus isolates from cattle, elk, and bison in the United States, 1998 to 2011". Appl. Environ. Microbiol. 78 (10): 3674–84. doi:10.1128/AEM.00045-12. PMC 3346378 . PMID 22427502. ↑ "Once-In-A-Lifetime Permits" (PDF). Utah Division of Wildlife Resources. Archived from the original (PDF) on November 11, 2010. ↑ "Alaska Hunting and Trapping Information, Alaska Department of Fish and Game". Wc.adfg.state.ak.us. Archived from the original on August 21, 2009. Retrieved February 19, 2011. ↑ "Alaska Hunting and Trapping Information, Alaska Department of Fish and Game". Wc.adfg.state.ak.us. Archived from the original on October 1, 2009. Retrieved February 19, 2011. ↑ "Alaska Department of Fish and Game". Adfg.state.ak.us. Archived from the original on August 24, 2010. Retrieved February 19, 2011. ↑ "Alaska bison hunt near Delta Junction". Outdoorsdirectory.com. Retrieved February 19, 2011. Dobak, William A. (1996). 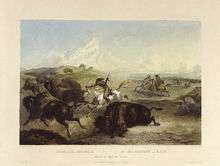 "Killing the Canadian Buffalo, 1821–1881". Western Historical Quarterly. 27 (1): 33–52. doi:10.2307/969920. Dobak, William A. (1995). "The Army and the Buffalo: A Demur". Western Historical Quarterly. 26: 197–203. doi:10.2307/970189. JSTOR 970189. Rister, Carl Coke (1929). "The Significance of the Destruction of the Buffalo in the Southwest". Southwestern Historical Quarterly. 33: 34–49. JSTOR 30237207. Smits, David D. (1994). "The Frontier Army and the Destruction of the Buffalo, 1865–1883" (PDF). Western Historical Quarterly. 25 (3): 313–38. JSTOR 971110. and 26 (1995) 203-8.